Forsythia bushes delight us each spring with their burst of cheery yellow flowers. This deciduous perennial bush has arching branches with flowers that come before the leaves appear. 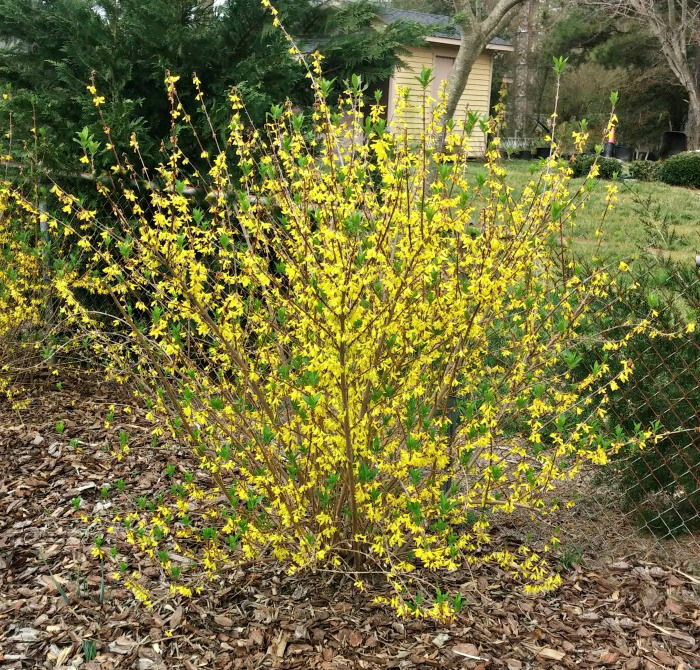 Planting forsythia is all about timing and spacing. The two best times are early spring and mid fall depending on your hardiness zone. The forsythia flower bursts into bloom well ahead of most early spring blooming plants. I get to enjoy it even before my daffodils show their sunny faces. A forsythia shrub looks wonderful as a border plant (I have one that hides a chain link fence beautifully!) and can even be grown as a hedge. 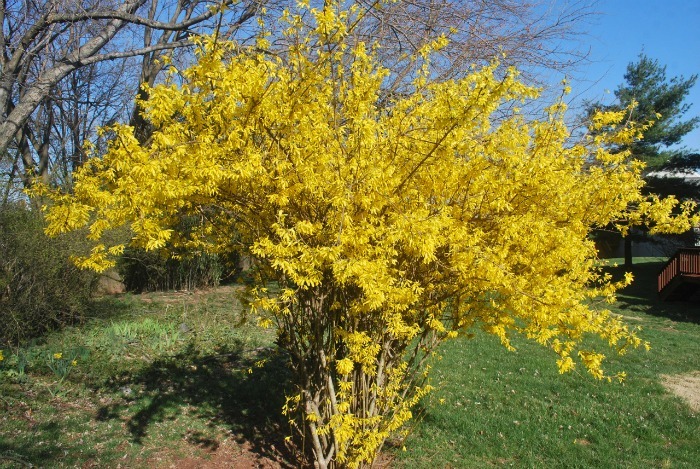 Most garden centers sell established forsythia plants. Lynwood Gold Forsythia is a very popular variety that many gardeners choose. It really lights up the spring with an abundance of yellow blooms. The plant is great for adding privacy and for focal plants in a garden bed. It can reach tree size that is up to 8-10 feet tall, so needs room to grow. Mature forsythia plants that have not been kept under control can take up a lot of room in the garden. Keep your gardening habits in mind when planting them. If you discover years later that your forsythia is too large for its space, you can move it. See my tips for transplanting forsythia here. 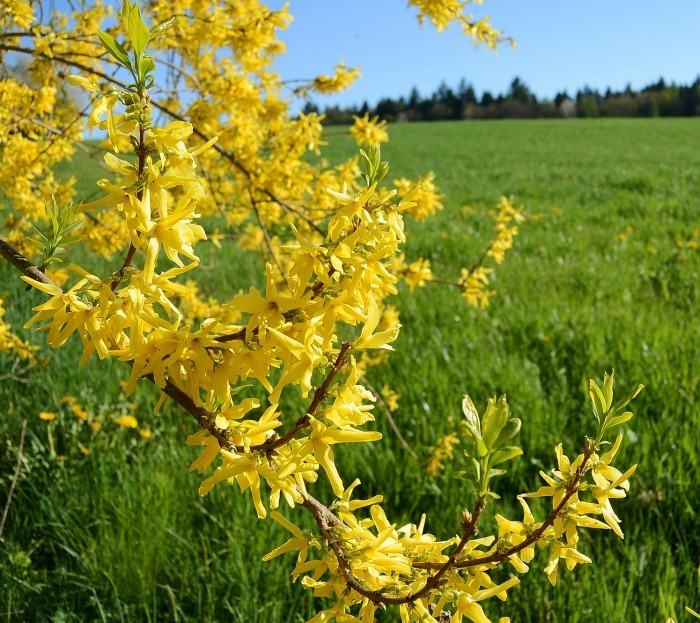 Forsythia can be planted pretty much all year long, other than when there is a frost or freeze. Timing depends a lot on your planting zone. If you live where the ground does not freeze, you can plant even during the winter months. Northern gardeners like to plant in early spring after the last frost in order to help the plant become established before a hard winter. One big advantage of spring planting is that you will be able to see the color of the blooms if you purchase locally. My one suggestion is not to plant in the middle of the summer unless you want to spend a lot of time on the end of the hose, making sure that it gets enough moisture. For most zones, early to mid fall (September or October) is a good time to plant, The weather is not too hot but the ground is still quite warm which encourages root development. Check your tag to see how tall and wide the plant will be when it is mature. One of the mistakes that many beginners make is to plant shrubs too closely together. They will end up crowding each other and won’t grow well. If the bush grows near a fence line, be sure to plant it in some from the edge so it will grow on the back side, too. Forsythia has a pretty arching habit and needs plenty of room for those branches to spread out. Be sure to space your plants to accommodate the size of the mature plant, particularly if you plan to grow them along a side of your garden as a border plant. I have mine spaced about 8 feet apart and now after three years the branches fill in the spaces between each shrub. Choose a location in your garden that gets full sunlight and has good soil that drains well. 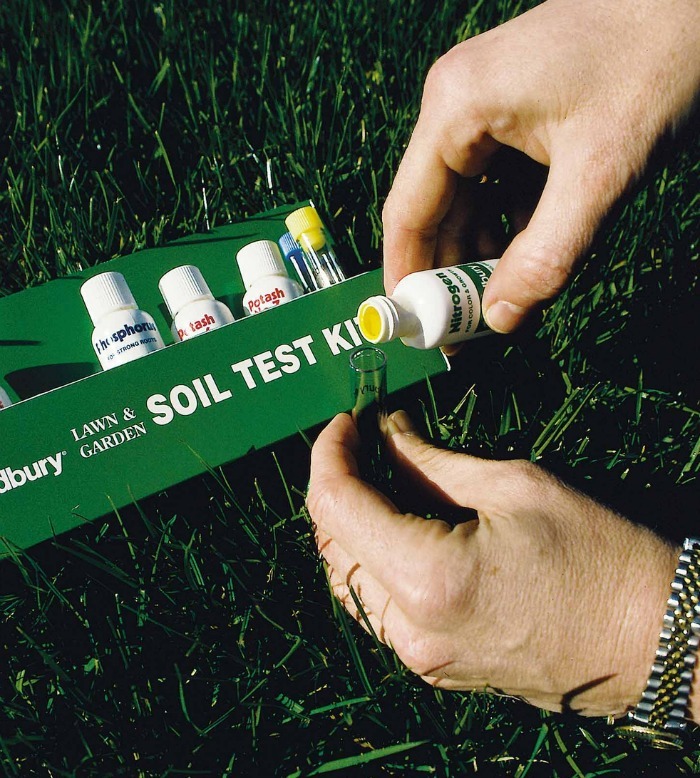 If you have a soil testing kit, check your soil. Forsythia likes a soil pH with a range between 6.8 and 7.7. Many local departments of agriculture will test your soil for free if you get in touch with them. If your soil is not in the suitable range, sublimed sulfur will help to lower the PH and powdered limestone will help to raise it. As with all perennials, I like to add in 2 to 3 inches of organic matter or compost into the planting area to a depth of about 10 inches especially if the soil is sandy. Dig a hole that is at least two times as wide as the root ball of your plant and the same depth as the root area. Remove the plant from the container and set the root ball into the hole. Make sure that it will sit at the same level with the ground. Fill in the space around the plant with more good quality soil and tamp it down firmly around the roots of the plant. Water the plant well. Transplanted shrubs can suffer a bit when moved from a pot to the garden and watering the area well gives it a better chance of withstanding the move with ease. After watering, the soil level many look lower near the crown on the plant. Just add a bit more soil It is best to hold off on adding commercial fertilizer until the plant has become established. If you order online, you will often get bare root plants which will be shipped according to your hardiness zone. These plants are available from many mail order nurseries. They are generally less expensive than potted plants, but are also smaller as well. 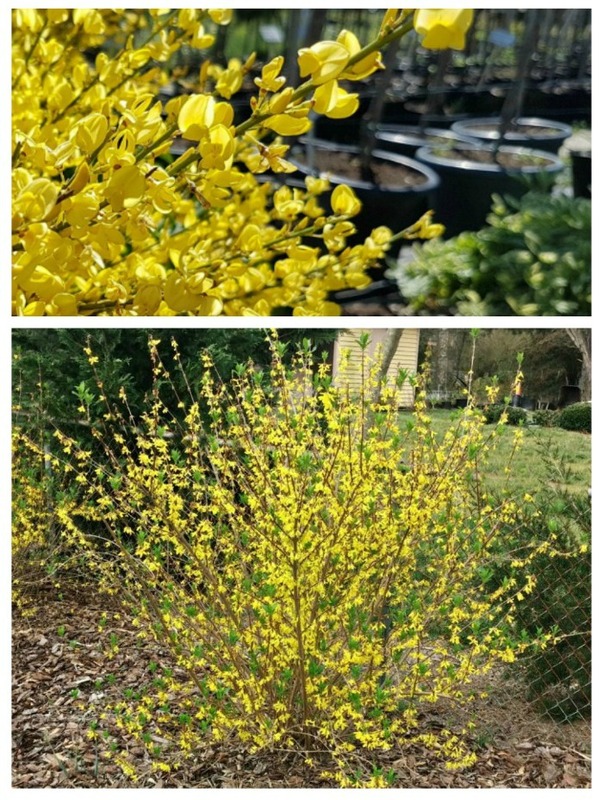 Forsythia is a fast grower, so a bare rooted plant may be perfect for you! 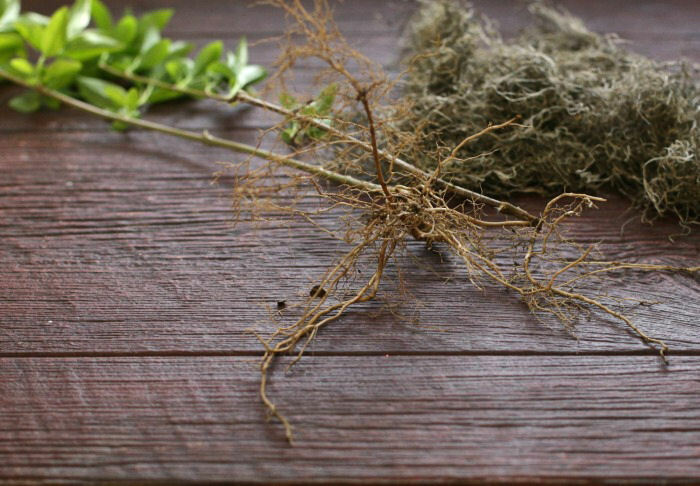 Bare root plants are shipped in a bag with a planting medium – normally sphagnum moss or shredded cedar. This is placed around the root system to keep it moist. Dormant plants will not have leaves. But actively growing plants may have some leaves showing. Prepare the soil in your garden by adding some organic matter and be sure to plant very quickly once the specimen arrives. The shipping medium should be added to the planting hole along with the bare root plant. 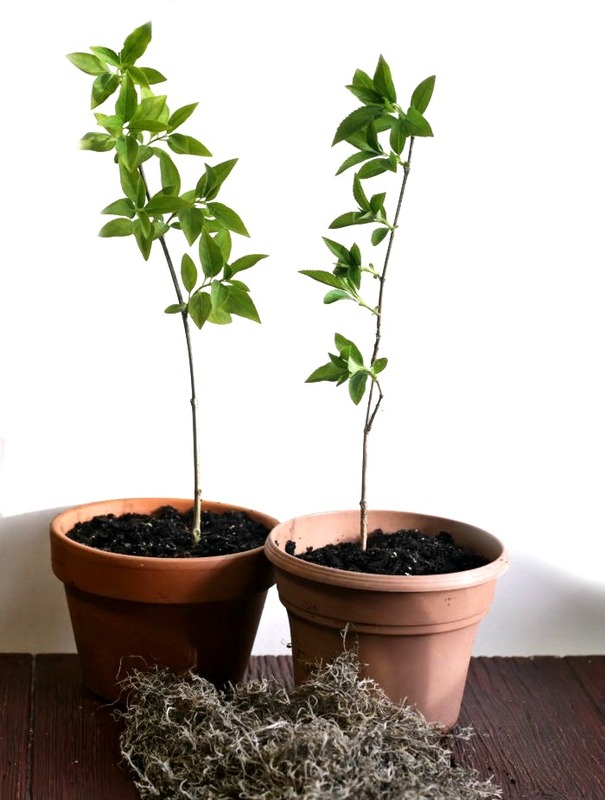 If you get a cold snap or you don’t have time to plant the bare root specimens in the garden right away, just be sure to get them into soil in pots as soon as they arrive. They will only last a short while in the shipping medium. Water the plant regularly for the entire first year. You will get the best results if you choose a bare root plant from a nursery in your own hardiness zone. Not only may it arrive more quickly, but it will have been grown according to local conditions. While buying plants from the garden centers is the quickest way to get a new plant, it is also the most expensive. Forsythia branches root easily and will give you new plants to use in other parts of your garden, if you are patient to wait for them to take root. And really, who doesn’t like plants for free? Layering and taking cuttings are the two of the easiest and fastest ways to root a forsythia shrub. The process is simple enough that even a beginner with not much of a green thumb can have success with this easy to root plant. Cuttings are best taken in mid summer from this year’s growth. These branches will be more tender and will root more easily. Don’t use the old stems which can be hard and woody. I use the cuttings from branches that have been “headed.” These will need to be removed to keep the arching shape anyway and the tips have tender growth that roots well. 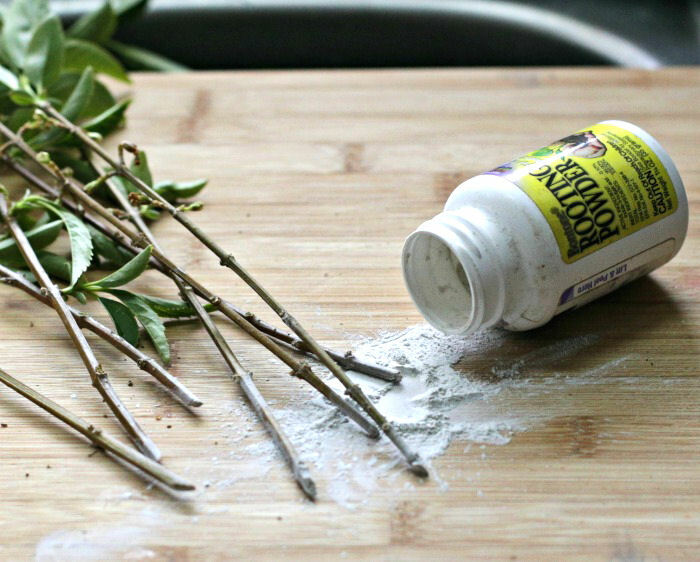 To take a cutting, just remove the leaves from the bottom have and dip the bottom tip in a rooting powder. Place them in sand or a good seed starting soil or perlite mix and keep moist. You should have rooted cuttings in 6-8 weeks. Then you can move them to their own larger pots with normal potting soil until they are more established and are growing. You can then plant them in your garden. 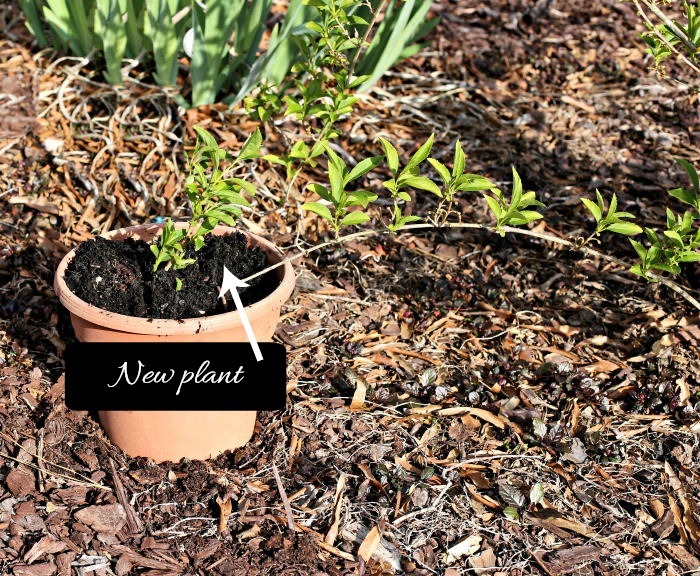 For a forsythia, this is the easiest way to get a new plant. To layer a branch, just place a pot near an established forsythia plant. Choose a branch that will reach to the pot and bury the stem under a few inches of soil. Stake the branch in place with a landscape pin and water. The roots will establish quickly and you can then cut the stem that connects the two plants and plant the branch with roots. It will grow easily into a new shrub. Once forsythia branches have taken root, you can transplant them in another area of your garden to give more of this showy plant to enjoy. It is best to move a forsythia bush in late fall or winter, when the bush is not actively growing, to reduce any chance of transplant shock. Two seasons ago, I had one forsythia bush take root just from having an arching branch touch the ground near it. I staked the branch down for a while to let the roots develop. It was then easy to chop off from the main plant and dig up to transplant in another border. It actually flowered a bit the last spring, and now just about 18 months later, I have a good sized shrub that is about 4 feet wide and 3 feet tall. It was mature enough this year to give me a nice show of flowers just a few weeks ago. 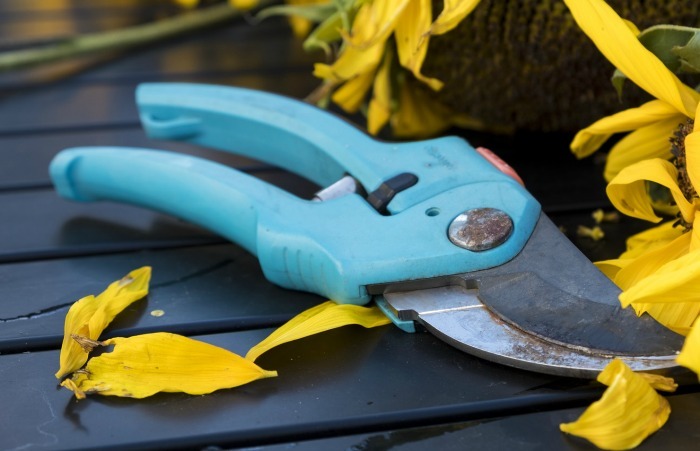 Knowing when to trim forsythia is important to make sure that you get those blooms every year. Established forsythia plants will need to be trimmed to keep their pretty arching shape and also to keep them a manageable size. 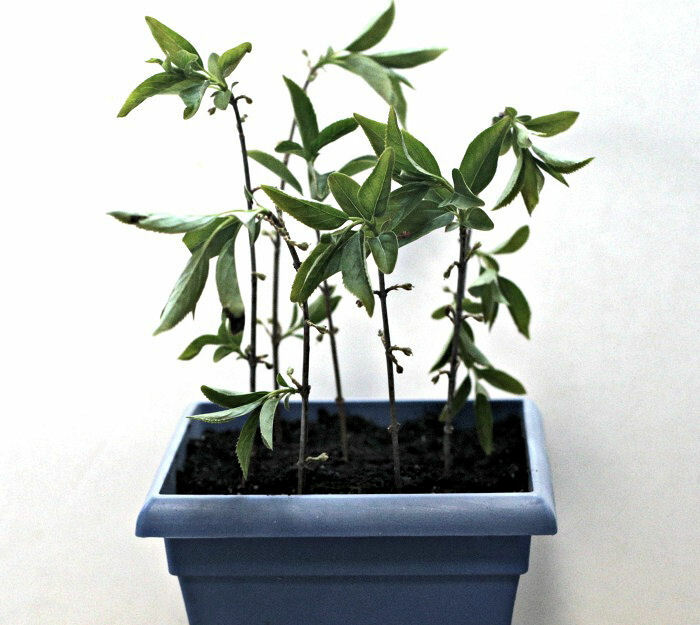 This is best done in the spring after flowering and when the plant is at least 1 year old since you will be removing whole branches. See my tips for pruning forsythia here. Overgrown forsythia bushes can get so large that general pruning won’t do the job of managing them. In this case, it is time for either renovation pruning or hard pruning. See my tips for this process here. Follow these tips for planting forsythia and you will be rewarded with the first sign of spring each year that beckons you out into your garden, with the cheery yellow flowers. 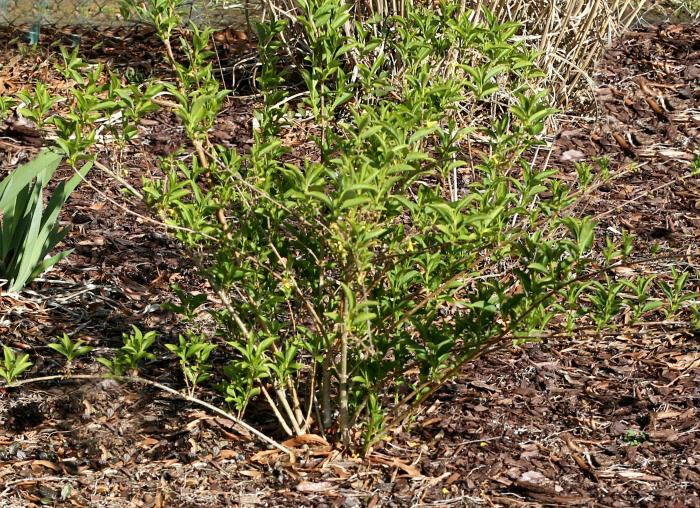 It is one of America’s most popular perennial shrubs for a good reason. 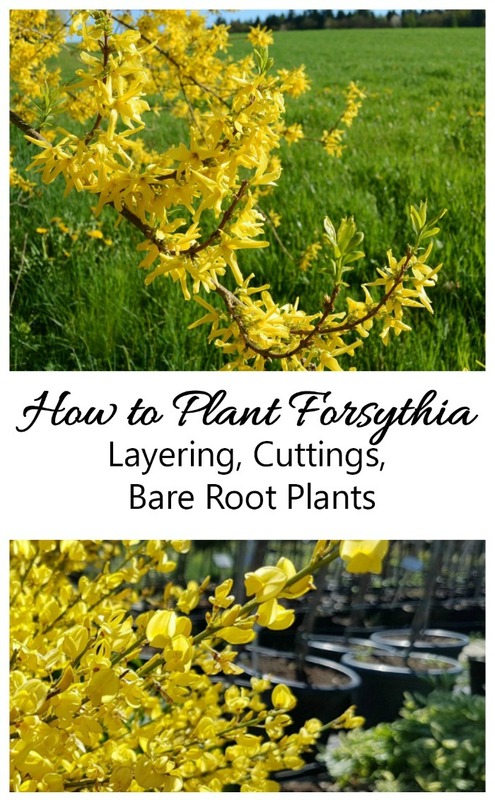 If you would like a reminder of this post for planting forsythia, just pin this image to one of your Gardening Boards on Pinterest. 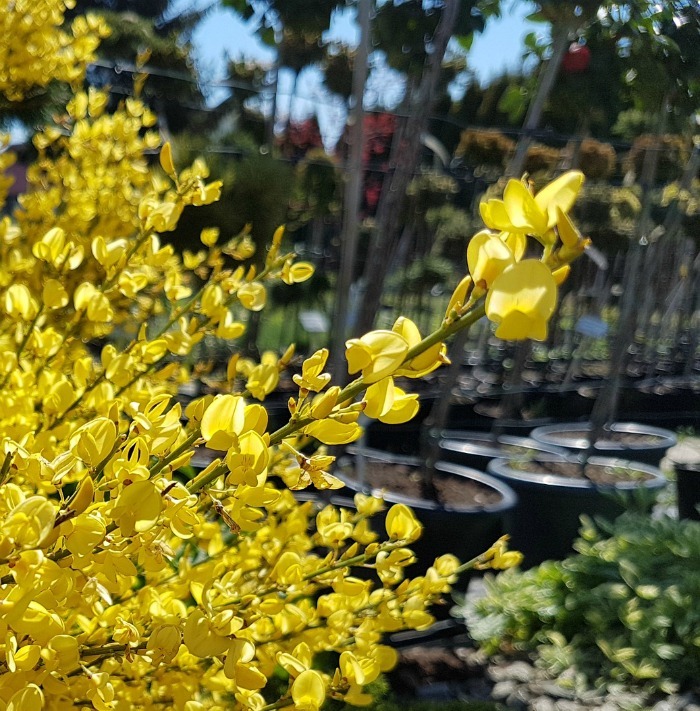 Forsythia is an easy to manage shrub but there are a few things you will need to know for planting, transplanting and propagating this perennial. Forsythia plants can be purchased in pots, as bare root plants or you can propagate it from a friends plant. Anytime there is no frost or freeze. Northern gardeners do best if the plant is planted in early spring. Southern gardeners do better planting in mid fall. This plant needs room to grow. Space 8 feet apart or you will need to move as the size increases. Plant where forsythia will get full sun for best flowers. Forsythia needs well draining soil. Dig a hold 2 x the size of the root ball and just as deep. Transplant shrubs in the fall when the plant is starting to go dormant. How far would you space them if you want to keep them 4’ high and as a hedge that covers a chain link fence? Hi Charles. I am in the process of pruning some of mine to make a small hedge in one area for the same reason. IN this case, you can plant them much closer together. Mine are going to be pruned to about 4-5 feet tall and I have added extra plants about every two feet between the existing ones that are about 10 feet apart. When you prune forsythia, it changes the growing habits of the plants, so you can space them more closely.